I spoke to the Ag 450 Farm class two weeks ago about agricultural marketing. It is the only completely student managed farm at a land grant university in the United States. I always find it a great experience to meet with the class, and enjoy visiting about decision making in pricing crops in the context of risk management. As with all things at the Ag 450 farm, it’s not a theoretical classroom exercise, but real. The issue in front of the marketing group in the class this Fall is the same one facing farmers, namely the $1.50 per bushel drop in old crop corn prices and $1.00 per bushel drop in new crop corn prices since September. The challenge is particularly acute for the class, as well as farmers, in thinking about forward marketing a portion of the 2012 corn crop when forward cash bids are now below $5.00 per bushel in central Iowa. What’s the upside potential? What’s the downside, particularly as the market moves closer to breakeven points? It’s more fun to make sales at levels $1 or $2 per bushel above cost of production, something most farmers experienced on at least a portion of their 2011 production. The point for discussion with the Ag 450 class was about decision making in the current market environment. Of course this includes timeless guides like knowing your break-even price and making pricing decisions based on it. A larger discussion ensued, however, about the the challenge of grain and agricultural commodity prices being hitched so closely to other commodity prices and economic events globally. If you can predict the likelihood of how events play out within the European monetary union, for example, then perhaps you can predict where corn prices will trade. Right. No problem. For the last ten years all commodity prices, to varying degrees, have experienced levels of variability not seen since the 1970s. Analysts for any of those same commodities can provide a list of reasons as to why. Middle east upheaval. Growing demand from China. Weather events. The list goes on, but the results are the same. Commodity prices have continued to drift upward, with accompanying increased in volatility. The CRB index tracks the prices of a basket of about 20 commodities, including agricultural, energy, industrials, and metals. With a notable hard break in the Fall of 2008, the CRB index has continued upward. 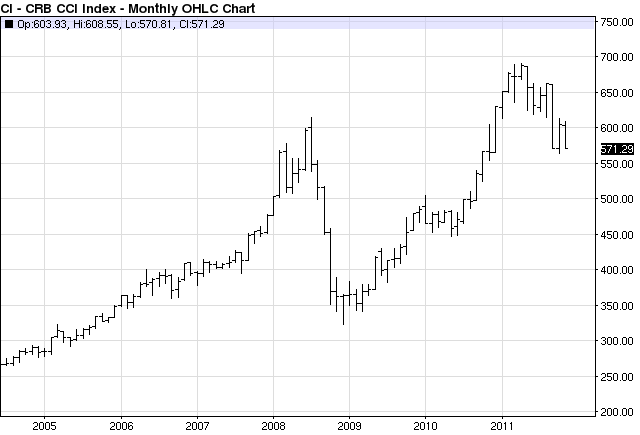 What does this mean for agricultural commodities? It implies a continuing period of volatility. The macroeconomic environment since 2000 (bursting of the tech bubble) and 2001 (September 11) has been one of cheap money and near-zero interest rates. This has led to a weakening in the value of the dollar. Commodities are priced in dollars, so the lower the value of the dollar, the higher the price of commodities. In 2000, one dollar purchased 1/270th an ounce of gold and 28 pounds of corn. In November 2011, one dollar purchases 1/1,700th an ounce of gold and 9 pounds of corn. Will corn prices go up or go down? Flip a coin for the answer. I think the more important question is whether they go up or go down by $2 or more? In an upward direction this implies high profitability. In the other direction it implies significant losses. For those with agricultural commodity price risk it implies a reward to discipline. A preordained discipline for covering breakeven is important no matter the method. I think it also implies a value to buying options, perhaps well-considered and timed purchases of both calls and puts. Risks of extreme price movements, up and down, place more value on being long options rather than short. There’s a cost to a long options strategy, but the current market environment, extreme variability, favors it. There is a history of the sort of bearish dollar economic environments we find ourselves in currently, and they don’t typically end well for agriculture. In a future post, I’ll provide some context on this history.